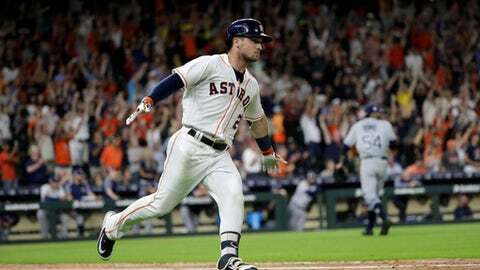 HOUSTON (AP) Alex Bregman hit a game-ending two-run double with one out in the ninth inning and the Houston Astros beat the Tampa Bay Rays 5-4 Monday night to match a franchise record with their 12th straight win. KANSAS CITY, Mo. (AP) – Bartolo Colon earned his 244th win, passing Hall of Famer Juan Marichal for the most by a pitcher born in the Dominican Republic, and Texas beat skidding Kansas City. DENVER (AP) – Brandon Nimmo homered twice during a huge night at the plate, including an inside-the-park shot to begin the game, and New York finally gave Jacob deGrom some run support in a victory over. The only hit off Williams was a single by Jonathan Villar with two outs in the fifth. The hit followed a walk to Hernan Perez, and the duo executed a double steal before Erik Kratz struck out to end the inning. ANAHEIM, Calif. (AP) – Paul Goldschmidt hit an early two-run homer and Zack Greinke pitched seven-hit ball into the seventh inning of Arizona’s 12th victory in 16 games in June. Ketel Marte and Nick Ahmed also homered and Jeff Mathis had a two-run double for the Diamondbacks, who opened a two-game interleague set with their ninth win in 11 games. Jarrod Dyson had an RBI single, and the center fielder also leaped to take away a possible game-tying grand slam from Justin Upton in the seventh inning. Upton and Albert Pujols hit back-to-back homers in the fourth for the Angels, who have lost seven of eight to fall well out of playoff position in the AL. Greinke (6-5) wasn’t dominant while yielding three runs and striking out five. Jaime Barria (5-3) yielded six hits and six runs in four innings for the Angels. SAN FRANCISCO (AP) – Miguel Rojas followed Lewis Brinson’s RBI single with a go-ahead base hit as Miami rallied in the ninth inning and overcame an early four-run deficit to beat San Francisco. Hunter Strickland (3-3), San Francisco’s second reliever, blew his fourth save in 17 chances. He walked Brian Anderson to begin the ninth then surrendered J.T. Realmuto’s RBI double.